Pleasanton: San Francisco's renowned jazz pianist Vuckovich to perform "Vince Guaraldi Tribute"
It's no longer possible to sit in a San Francisco jazz club and hear fiery Latin jazz or sweet melodic tunes played by pianist and composer Vince Guaraldi, who died in 1976 at age 47 -- but that doesn't mean his legendary music is a thing of the past. People worldwide rejoice in the compositions he wrote for Charles Schulz's 17 "Peanuts" television specials and 1969 feature film. Scores of musicians, not only pianists like Windham Hill artist George Winston but jazz masters Wynton Marsalis, David Benoit, Dave Brubeck and others trace their early interest in music or aspects of their performing style to Guaraldi. 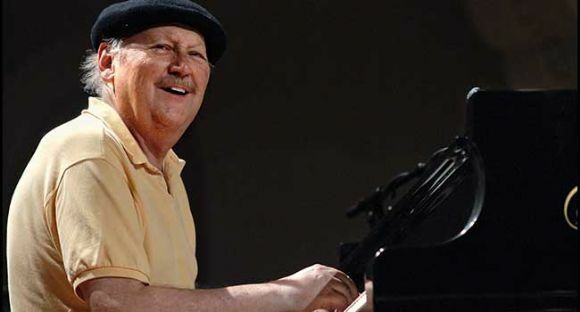 Not the least among them is San Francisco-based jazz pianist, composer, bandleader and recording artist Larry Vuckovich, who brings his "Vince Guaraldi Tribute" to the Firehouse Arts Center for a concert at 2 p.m. Sunday. Yugoslavia-born Vuckovich came to the United States in 1951 and lays claim to being Guaraldi's one and only student. "I'd heard American jazz on the Armed Forces Radio station before my family and I immigrated. I used to buy Big Band records, then started going to the Black Hawk, where I met Vince," Vuckovich recalls. The Black Hawk was a club in the Tenderloin district well-known for presenting high-caliber artists like Art Tatum, Miles Davis and others. Vuckovich remembers feeling that if he could learn to be "a swinging jazz player" like Guaraldi, it would pivot his career. "Vince liked playing up-tempos, but also pretty ballads. Sambas he wrote have intricate melodies that take skill. But not all (his works) are complicated. Some are melodic, played with just one or two fingers and no busy notes." Vuckovich is classically trained and studied music at San Francisco State University but says learning by listening was his primary approach. His professional career developed on the East and West coasts, especially in long-term associations with lyricist Jon Hendricks, as house pianist for a number of San Francisco jazz clubs and in special projects and recordings that brought him to Lincoln Center, Yoshi's and festivals in the United States and Europe. In 1973, Guaraldi chose him as his piano partner for his two-keyboard quintet, "Powder Keg." "Playing with him, I had to match his energy," Vuckovich says. "I had to dig in so there wouldn't be a down energy." Most often during his private lessons, Vuckovich says that instead of lectures on method and technique, Guaraldi would just play the piano to demonstrate a concept. "The emphasis was on listening. I learned jazz harmonies and melodic lines by listening to the records of the masters, like Art Tatum, Bill Evans, Hank Jones. We'd talk about the "piano touch," or about playing thick harmonies that resembled Big Band riffs and motifs." The setlist for the tribute show at the Firehouse is designed to bring Guaraldi's full spectrum of talents to the forefront. "Vince is known for Charlie Brown music, and I'm partial to 'Christmas Time is Here,' and we'll play that even though it's past the season. But they don't know his true jazz, Latin and Brazilian side. He liked funky stuff. His 'Cast Your Fate to the Wind' is one of the earliest fusion pieces, with a pop, jazz, bluesy, funk sound." Among other works chosen to demonstrate the breadth of Guaraldi's compositions, Vuckovich plans to share a house recording he owns of Guaraldi playing a song the jazz legend never recorded, "Blue Lullaby." Joining Vuckovich will be band members Josh Workman, guitar; John Santos, Latin percussion; Jeff Chambers, bass; and Leon Joyce, drums. To this day, Vuckovich can't explain why Guaraldi agreed to take him on as a student. "I don't know why he took me, because he turned everybody else down. He didn't hear me play until I went to his house so he must have liked the feeling I gave off. In those days, whether you could swing or not, whether you had soul -- that's what mattered." Once, while listening to the hard groove and soulful playing of American bebop pianist Hampton Hawes on a recording, Guaraldi paid Vuckovich a compliment he treasures. "He turned to me and said, 'You and I, we have this feeling.' I'll never forget that." Where: Firehouse Arts Center, 4444 Railroad Ave. in Pleasanton. Tickets: Reserved seating, $15 to $25; available at www.firehousearts.org, 925-931-4848 or at the center's box office. ©Copyright Larry Vuckovich. All rights reserved.